Zerica/BeviLaNatura are proud to be exhibiting their multi-award winning Natura Hot’n’Cold drinks dispenser at Vendex Midlands. To say that the Hot’n’Cold had a good year in 2018 would be a wild understatement. 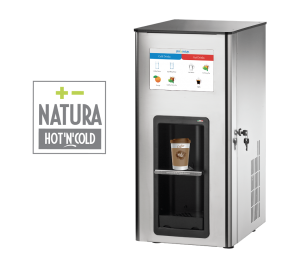 The Natura Hot’n’Cold is a total drinks solution with no single-use plastic in sight, dispensing coffee, iced coffee, hot tea, iced tea, hot water (to make your own tea), juice and chilled water all from one compact machine. 2018 was a magical year for the Natura Hot’n’Cold. Launched in March it won a prestigious SCI Equipment Award for Sustainability, Cost savings and Innovation at the FHA in Singapore in April. It was finalist for a Catering Insight Award 2018 for sustainability in November and went on to win the Energy Efficiency category at the Foodservice Equipment of the Year Awards 2018 in December where it was called ‘a shining example of foodservice equipment innovation’. The whole BeviLaNatura range is simply brimming with IoT technologies. Real time data collection and transmission over the internet means that the machine’s settings can be managed remotely via an internet portal. Advanced telemetry is used to collect and publish a wide range of data. Technical measurements of what is going on inside the machine such as voltage, pressure, temperature and more are also all available. With such high levels of management and monitoring available, even remotely managing multiple sites becomes much easier and the job of technical support is massively facilitated. Engineers can diagnose remotely and go to site confident they have the right tools and spare parts for the job and in some cases, they can actually solve the problem remotely. 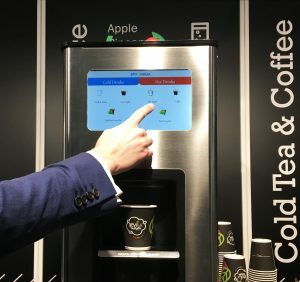 Particularly of interest in a vending environment, the machine can be configured to accept mobile-app-enabled payments and now also NFC enabled payments. Bespoke videos and adverts can be displayed on the large interactive touchscreen to ‘animate’ the dispenser and you can even personalise the exterior of the machine by wrapping it with customised graphics. The BeviLaNatura system is 100% designed and manufactured in Italy to exacting standards. Thoughtfully and precisely designed and engineered with inimitable Italian flair. The BeviLaNatura team will be out in force at Vendex, so come by and enjoy a drink, hot or cold, and see what all the fuss is about!